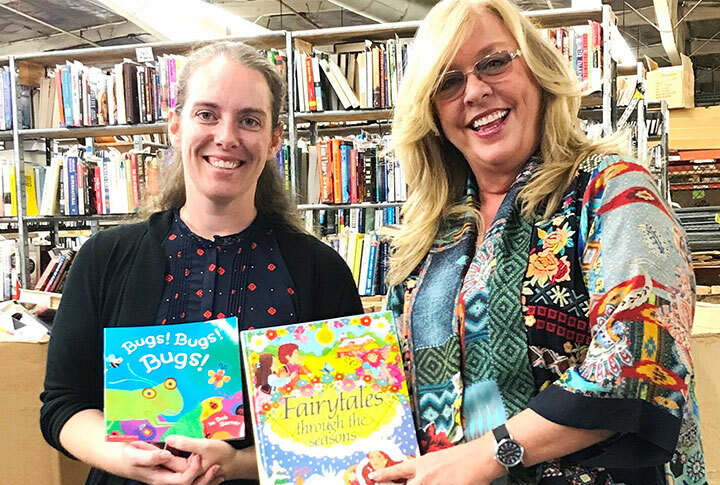 Goodwill of Southern Los Angeles County (SOLAC) is donating more than 50,000 children’s books to 16 Long Beach schools this month. The gently used books were originally donated at Goodwill SOLAC donation centers. The total value of the books is estimated at $100,000. Schools receiving the books are Addams, Bancroft, Chavez, Grant, Holmes, Hudson, Hughes, Jefferson, Longfellow, Muir, Powell, Robinson, Rogers, Roosevelt, Stevenson, Washington and Willard. GOODWILL – Roosevelt Elementary School teacher librarian Darla Castillo joins Goodwill SOLAC President and CEO Janet McCarthy inside Goodwill SOLAC's donations processing center.